A while back, Senses of Cinema offered a mini-dossier on Wong Kar-wai’s cinema on the occasion of the release of his In the Mood for Love (2000). A number of writers were invited to pick a word that for them invoked Wong’s cinema and to write a short piece moving out from that one word. (Full disclosure: I was one of the critics asked to participate. For what it’s worth, my word was “Look”, as in the highly designed look of Wong’s films.) While the attempt to find a key-word that encapsulates the impact of a film-maker’s oeuvre might seem a process of reduction – the body of work turned into stereotype – my own sense of the exercise was that in the case of Wong Kar-Wai it actually enabled an opening up, an entry-way to an expansive sense of the multiple resonances Wong’s cinema can possess as narrative experience and psycho-social disquisition alike. Likewise, in his new volume on the director – the first single-authored full-length study of Wong in English – Stephen Teo productively takes Wong’s cinema as in excess of any reductive critical pigeonholing. Teo specifically eschews some of the standard cliches of Wong’s films – for example, that they are “shallow” or are dominated by a “postmodern” fetish of visual surface – in order to posit that Wong’s cinema derives its force precisely from its in-betweeness, its lack of fixity in any reified identity. Wong’s is a cinema in motion and mutation, from the frenetic vitality within the frame to the blur of genres the individual films enact to the larger instability of its connections both to the Hong Kong film industry it derives from and the international art cinema and festival circuit it will enter into. After a broad introduction to these issues, Teo’s book basically adopts a chronological approach, moving one by one through Wong’s films, including his TV commercial work and 2046 (2004), the cherished feature project he has continued to refashion even after its Cannes premiere. For each of the films, Teo provides production and reception history, and analyses theme and style with references back and forth to other Wong films. But even as each section on the specific works moves in detail through their textual nature, Teo never loses sight of broader frameworks for understanding the significance of the films. To my mind, it is Teo’s inscription of Wong in larger contexts of nationality and transnationality that represents the most productive aspect of his concise yet comprehensive volume. An expert on Asian cinema, Teo knows both Cantonese and Mandarin and this serves him well in showing how, even within the Chinese context, Wong is situated within cultural crossroads. 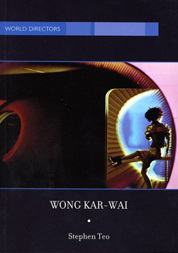 Coming from Shanghai – and possessing a bitter regret for the passing of that city’s way of life especially in the 1960s – Wong created in Hong Kong a cinema that is both intensely futurological and wistfully nostalgic. Probably the most unique aspect of Teo’s charting of the role of intertextuality in Wong’s films comes in his assertion of the importance of literature to the director. Other critics have noted how the narratives of Wong’s films often seem to borrow from literary models he professes to admire (for example, the fiction of Manuel Puig). But most of these analyses have tended to remain at the level of debts in story content. In consequence, the extent to which Wong’s films are so immediately visual – so seemingly specifically cinematic – has meant that most critics haven’t looked at what we might paradoxically term the literariness of the film’s filmic formal qualities. It is worth noting how this passage moves from literature to painting and thereby suggests the rich diversity of aesthetic heritages from which Wong’s cinema takes its inspiration. From textual to intertextual to contextual readings (and back again), Stephen Teo offers a sharp means for clarifying why Wong Kar-wai’s cinema has become so significant. If Wong’s films seem initially to captivate through the immediacy of a visceral visuality, Teo shows how they also go beyond mere surface appeal to tap into a panoply of concerns both aesthetic and social. Wong Kar-wai, by Stephen Teo, British Film Institute, London, 2005.